It takes 6.8 Buyers to get a decision made. 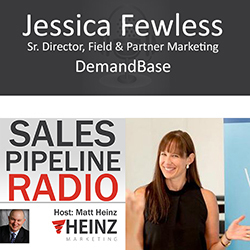 In this replay, we are very excited to talk with Jessica Fewless who joins us from DemandBase. We are going to be talking about the increased complexity of selling into B2B marketing; into B2B targets; the fact that the buying committee internally is getting larger, more complex. More than just picking off the right targets and speaking more precisely to the right people, organizing consensus inside of an organization to help increase sort of focus and velocity is what Matt thinks is a key part of ABM as well. He asked Jessica to talk a little bit about what that means and sort of that internal buying committee and how effective ABM can make sense of that. Jessica told Matt,"this is really where sales can feel the most support from marketing is around this entire buyer’s committee because typically what they are going to be doing is they are going to be focusing on that person with the budget authority, need and the time light, right? That whole BAND model, because that’s a person who is going to sign the contract, right? So that is generally where their efforts are spent; one – because that’s the only person they actually have access to. So sometimes they act as a gatekeeper to the rest of that stakeholder committee but two – they only have so much bandwidth so they need to focus on that person who eventually is going to sign their contracts." It was such a rich episode, we felt a replay was in order. After 3.5 years at Demandbase (and 20+ years in B2B Marketing), Jessica has seen it all when it comes to Account-Based Marketing. Playing an instrumental role in Demandbase’s rollout of an ABM strategy, and educating over 1000 B2B marketers on the principles of ABM over the last 18 months, Jessica has become a resident expert. From building the right target account list and understanding the impact of ABM on marketing programs, to selling ABM within an organization and finding budget for your strategy, Jessica has worked with organizations to build, hone and measure the success of their own ABM strategies. The buying committee internally is getting larger and more complex. We are talking about account based marketing and strategies to get into the fold of these more complex groups of decision makers. What is Account Based Marketing to you? Jessica says, "Account Based Marketing (ABM) is really understanding who is your target audience and building a marketing mix around going after that target audience. And, along the way, building your sales force in the mix so you can align the sales messages with the marketing strategy. THis helps them close more deals, faster and with a larger contract value. It makes your entire sales orgnaization more efficient. Instead of throwing them over the wall and hoping they make it, ABM lines up the budget behind those targets and budgets with these goals." A number being quoted regularly is that six people are typically involved in the purchase process. Many times it's way more than that in enterprise companies. You need to focus on the person who is actually signing the contract, but you have to gain buy-in by the committee. This reuqires that sales brings the same message developed by marketing. Jessica has a list of tips in this show. Get your pen out.